We could see a gasometer, and unfortunately smell it, from my UK, inner city school playground! I wonder if this view seemed normal to you or if you appreciated it at the time. The expance of sky is amazing. I just love the views you post. Thank you. That’s a great view. In my city more and more of these sorts of fields are being boxed in by developers, or, worse, being filled with portable classroom trailers as a cheap way to expand the school’s enrollment. Fantastic picture. When I read your post KathyS, I wondered what a gasometer was… thanks for *cough* educating me. :D I understand what you mean, but I can say that I haven’t grown numb to the views and appreciate them whenever I see them. This kind of view is something that I do miss when in Johannesburg… and there I guess you do have a point – spending time away does make me appreciate the hills and mountains more when I return. SteveH, it’s really convenient to live where there are plenty of hills and mountains – it’s difficult for developers to obscure them. They do try though… Thanks for the compliment. Beverley, indeed it is, indeed it is. It makes me think about Camps Bay High School. It’s situated above the beaches of Clifton. Now that’s a school with phenomenal views! 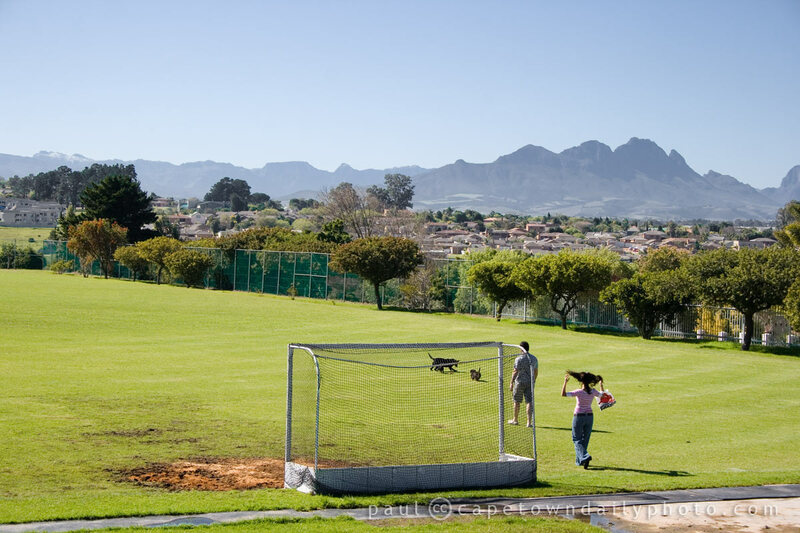 There are a couple of schools in Cape Town and the Boland which are in some of the best spots anywhere. It makes one very envious.